Pivot is a quilt made from the pattern by Nicole, of Modern Handcraft. The design is simple, graphic and very modern. I decided to make it in primarily solids with the addition of one geometric print. It's a concept I used for my Swoon 16 quilt and of all the quilts I've made, still one of my favorites. 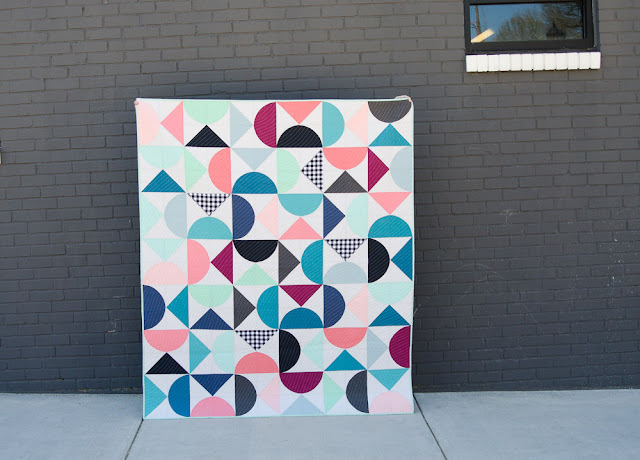 Once the quilt was pieced, I second guessed the addition of the geometric print and actually still wasn't sure about it until I saw the photos. There's nothing like stepping back to look at your creation and seeing it in it's entirety. I think sometimes in the making, we're constantly looking too close at our work. Good lesson learned - step back more often. I wondered what others thought and threw my question out on Instagram. Everyone who commented agreed - it kind of makes the quilt! I used wavy, echoed lines for the quilting and love how they turned out. I'm continuing to go through Jacquie Gering's book, Walk, looking for new straight line ideas. The back is a print from Anna Maria Horner that was in my stash. I thought the colors blended nicely. 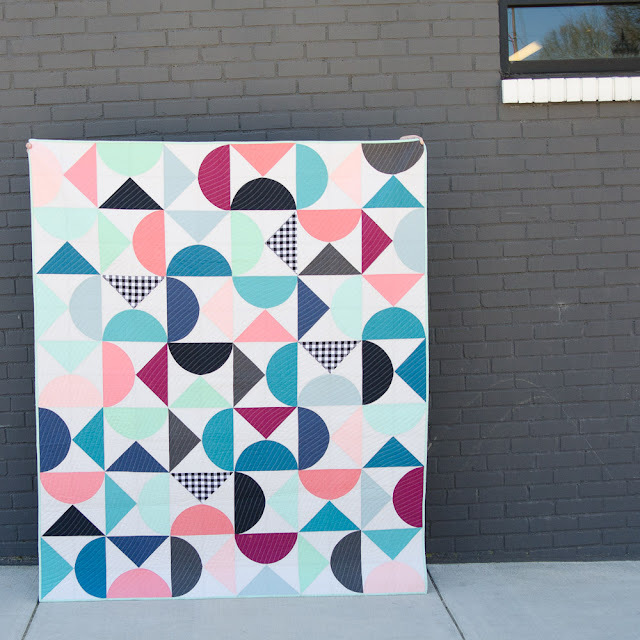 I photographed the quilt in front of a building in the Village of West Greenville, SC. I had to share with you the new sculpture that was just installed in the same plaza. 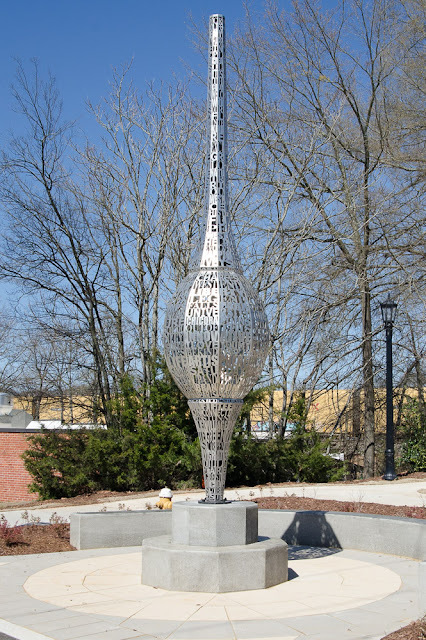 Our city is rich in textile mill history and the sculpture represents a spindle. 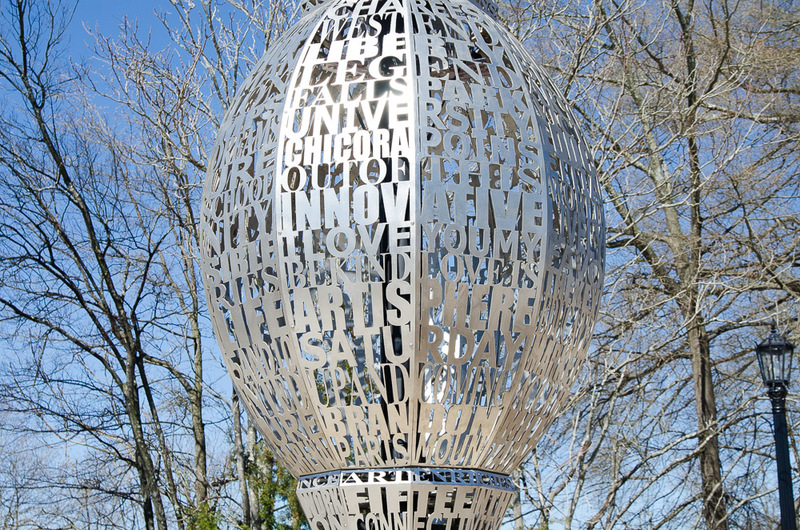 The words on the piece relate to the city also. 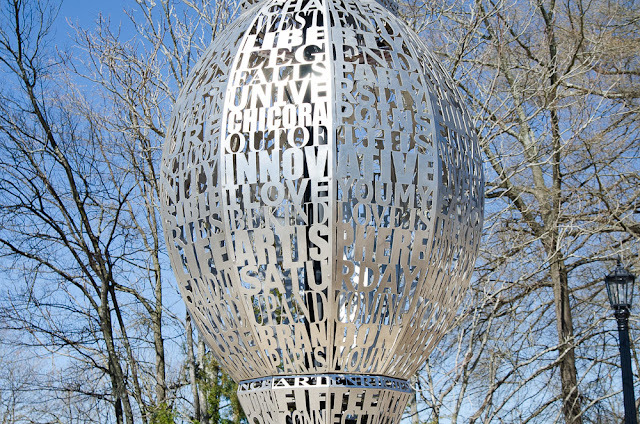 The artist is Blessing Hancock. I love it so much! 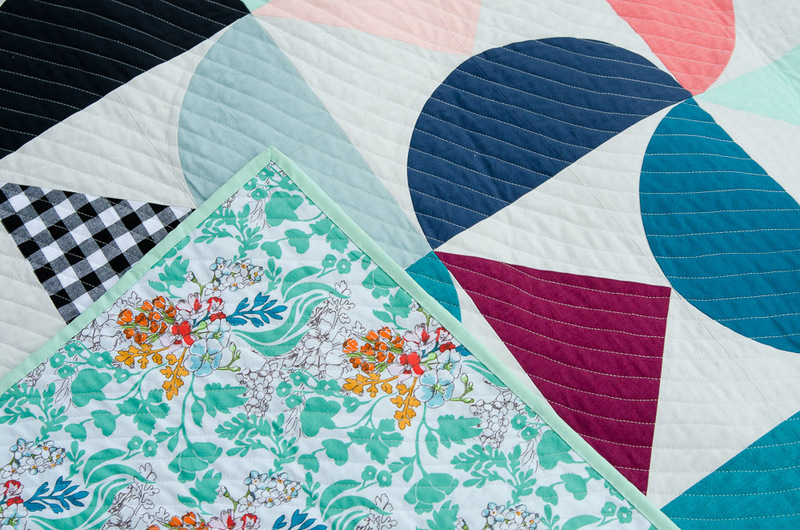 Your quilting looks amazing too! I too like the addition of the gingham. Lovely finish! 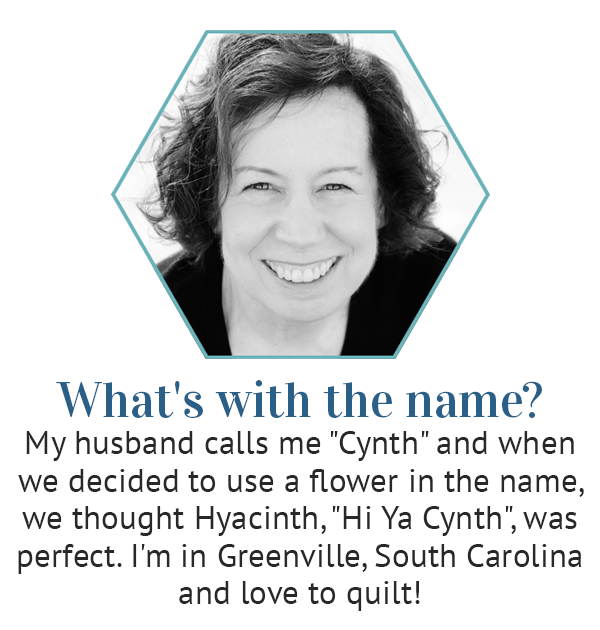 After living in Greenville for 35 years, I do believe you've seen more of the city than I have! I love it! I love the wavy quilting, I have Jacqui’s book, but never really used it! It is a huge lesson to take a step back; getting a photograph of a project always helps me see it a little bit differently, even if the photo is just of blocks on a design wall. I think that the plaid works so well here because of the care you took in keeping it square in the piecing, too. Beautiful finish! Cindy, this quilt is so cool. I love the fabrics. What super fun blocks!! Oh and the quilting. I like that. Well done!! 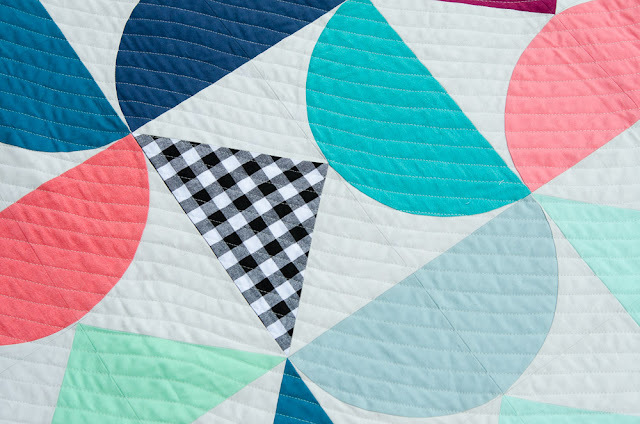 Love your pop of one geometric print on the Pivot quilt. Great job!